Astrophotographer Miguel Claro sent a photo of a skywatcher in silhouette, appearing to hold up the night sky in the Azores, Portugal, on May 4, 2014. The constellation Sagittarius glows at the left, with Scorpius on the right. 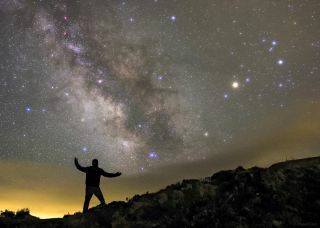 A skywatcher embraces the cosmos like Atlas of Greek mythology, holding and protecting the clouds of the Milky Way from a low cloudy yellow band at the bottom of the image. But today's Atlas would seem to be condemned not by Zeus, but by the light pollution created by all of humanity, said astrophotographer Miguel Claro. He sent in this photo taken by the Lagoa do Fogo (Lake of Fire) on the central Sao Miguel Island in the Azores, Portugal, in the North Atlantic Ocean. The constellation Sagittarius glows at the left, with Scorpius on the right. See the annotated version of the image for the constellation shapes. Annotated version of night sky photo over the Azores, Portugal, on May 4, 2014, showng constellations Sagittarius and Scorpius. In an email message to Space.com, Claro writes: "The magnificent presence of our home galaxy, the Milky Way , [has] been a true inspiration for musicians, poets, painters, writers and artists in general. Unfortunately, two thirds of … humankind [has] not yet had the opportunity to see the Milky Way with their own eyes, to let [themselves] fall in love [with] the beauty and greatness of the universe around us." He adds that the Earth is important as the sky, and our planet has been our spaceship in the journey through time and space. Claro used a Canon 60Da camera shooting at ISO 2500, 24mm at f/2, with an exposure of 20 seconds. He obtained the photo on May 4, 2014 at 4:48 AM (local time). Editor's Note: If you capture an amazing photo of the night sky that you'd like to share for a possible story or image gallery, please contact managing editor Tariq Malik at spacephotos@space.com. Follow us @Spacedotcom, Facebook or Google+.